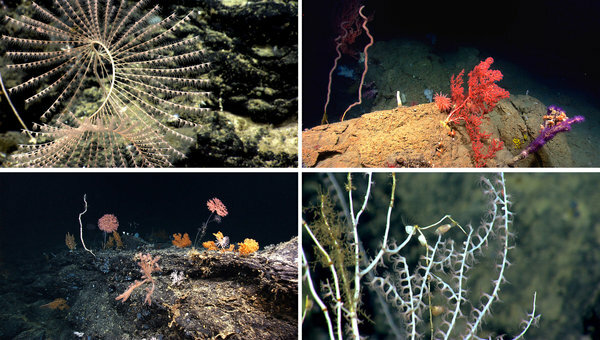 Ecosystems of deep sea corals of various shapes and hues can be compromised by bottom-fishing. Squid fishing may be regulated in the mid-Atlantic. A council that sets regulations for fishing off the mid-Atlantic coast will meet on Wednesday to consider protections for little known and fragile ecosystems of deep sea corals in and around 15 ocean sites. Environmental groups and sport fishermen are pushing for protection of these canyons and other sites, which run from Block Canyon off New York to Norfolk Canyon off Virginia, from squid fishing. They also are lobbying for other restrictions on fishing in a much broader zone. The squid-fishing industry is opposed to the broader restrictions and has proposed further study and more limited boundaries on four of the canyons, as well as further discussion on the other canyons. Some of the corals could also be affected by oil and gas drilling in the Atlantic, after President Obama said last month that he would open up the region to oil and gas leases. However, different agencies are involved in that process. The canyons are distributed from New York to Virginia, while the drilling leases would be granted from Virginia on south, an area that would include Norfolk Canyon, and perhaps part of another. Scientists and fishermen have known about the corals for at least a century. They live hundreds of yards below the ocean surface and support diverse communities of life. The areas attract all sorts of marine animals at different times of year, including squid. Researchers and the fishing industry have steadily learned more about the corals since the 1950s, and particularly in the last decade or so as the National Oceanic and Atmospheric Administration has used submersibles and remotely operated vehicles to probe the depths and capture new information, images and video. Peter J. Auster, a marine biologist who is an emeritus professor at the University of Connecticut and senior research scientist at Mystic Aquarium, has studied the corals for 30 years and said that they had been found on steep slopes of seamounts and in canyons that were cut into the continental shelf. “These are incredible landscapes,” he said. Because the corals grow slowly, bottom-fishing for squid and fish could knock them over and the communities would not recover for many years. The canyons that are being considered for protection are, Dr. Auster said, refuges for organisms that used to be more widespread. “The choices are what we do with what’s left,” he added. The group that makes the choices is the Mid-Atlantic Fishery Management Council. It is meeting in Raleigh, N.C., and the amendment under discussion would affect its regulations for mackerel, butterfish and squid fishing. The amendment includes a complex variety of provisions that cover depth, type of fishing and boundaries, but the main items for discussion are protection of the canyons and a set of restrictions for a broader zone. Squid fishermen say the restrictions would damage an industry that has been responsible and is sustainable. Greg DiDomenico, the executive director of Garden State Seafood Association, which represents New Jersey commercial fishing businesses, said his group supported protecting the corals. “There’s no denying that these creatures are extremely important,” he said. But he argued that the proposed amendment was not based on sound evidence. “We don’t really know what’s down there,” he said. And so he is asking for further study, and his group has recently submitted new proposals. The prospect of a delay disturbs some of the advocates for strong protection, including John McMurray, a sport fisherman who is a member of the fisheries council.